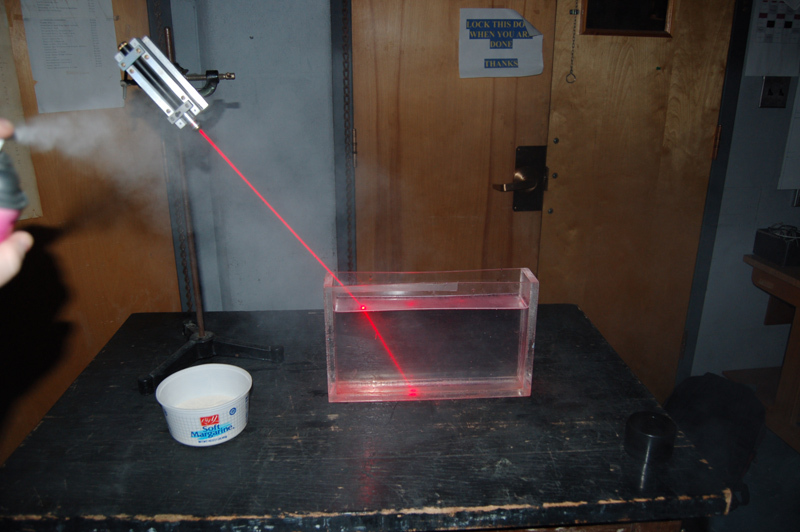 Description: This demonstration shows what happens to laser light when it encounters an air-water surface. Fill the take up with water. Add a little milk powder to the water. Mix it in. Attach the laser to the portable stand as shown in the picture. Angle the laser to enter the water at roughly a 45� angle. Spray the compressed air just above the top of the plastic tank. You can also use chalk dust. Note the angle of incidence and the angle of refraction. They are not the same. This is because light bends as it travels from an air to water medium.